Caitlyn was born in Virginia but moved to South Florida when she was just 7 years old. There she was exposed to multiple cuisines and cultures. 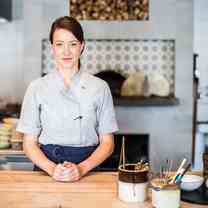 After leaving Art School to attend the CIA, she earned a Bachelors in Baking and Pastry Management. 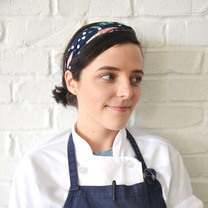 She spent the years after that traveling around the South, and then finally found her home in Nashville where she is the Pastry Chef at Henrietta Red. From brunch pastries to bread to after dinner sweets, she's always excited to "dream weave" as head Chef Julia likes to call it. Our goal is to do more than just feed people's stomachs. "The ladies from @brittanny_anderson the queen of schnitzel with her beef tongue rendition! yum yum yum on everything! 🥩🍮🍞"
"Pepita Gianduja • Coconut Cream • Grappa Fluid Gel • Chai Pumpkin Sherbet ☕️"
"Fennel infused Yogurt • Tahini Challah • Sesame Crumble • Concord Sorbet • Elderflower Granita •"
"We’ve been having so much fun in the kitchen! The appearance of winter squash is a little hard to stomach but @row7seeds makes it a bit more palatable 🌿🍃🍂🍁 898 Squash raw with cantaloupe, sungolds, peanuts, herbs, chilis, lime and fish sauce. Holding out on roasting..."
"Its a New Morning with Sugar and Spiced Morning Buns + GF Zucchini Bread 🌇🍫🍊"
"🍈 watermelon • cantalope • honeydew #recipetesting"
"🍋 lemon posset with sarsaparilla sherbet and blackberries • plum panzanella with zucchini bread and sunflower seed halva 🍑🍞"